The ancestry and rationale of the St Johns Heritage Parkway is as intriguing as the river it is named after. The St Johns River, also called the “river of lakes,” or Welaka, is a slow northern flowing and meandering river connecting multiple sloughs, lagoons and large lakes. Much like the river, the St Johns Heritage Parkway will be realized through a collection of independent efforts and joined by a collective need for emergency evacuation, economic development and appreciation of our natural resources via ecotourism. It is difficult to identify the original author of the St Johns Heritage Parkway: with documentation of the concept dating back to the early 1990’s. The first brand name of this transportation corridor was “The Palm Bay Beltway,” and was borne from the 1998 Southwest Brevard Transportation Study. In 2001, a PD&E study commenced for the “Palm Bay Parkway” to connect west Malabar Rd northbound to Pace Rd, Emerson Rd, Highway 192 and Ellis Rd/John Rodes Boulevard. The study was completed in November 2004, which included an approved Environmental Assessment (EA) and Finding of No Significant Impact (FONSI) by the Federal Highway Administration (FHWA) on December 11, 2003. To comply with State and Federal laws, in August 2007, a re-evaluation and updated PD&E commenced to identify changes in social, environmental and economic impacts. Moreover, the PD&E re-evaluation included a proposed Washingtonia Extention, which would extend the final corridor from Malabar Rd to Viera. The re-evaluation study should be completed in early-2011. Good planning and coordination is paramount to ensure a viable and feasible product. There has already been a significant effort by multiple jurisdictions to negotiate with landowners within the proposed alignment(s) for right-of-way acquisition. Millions of dollars has been appropriated and spent in anticipation of the final engineering/design to be completed in late 2010. County Commissioner Andy Anderson stated on April 7th, 2009 that he would like to see Phase I of the Parkway break ground by 2012 [Update -- Groundbreaking took place last October -- LINK]. How long has the Parkway been a priority for Brevard County? Originally called the "Palm Bay Beltway," then "Palm Bay Parkway:" the St Johns Heritage Parkway has been a high priority to Brevard County. 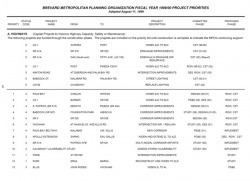 Click on the accompanying image to see the 1999 Brevard MPO Project Priority Official Records. In addition, you may want to visit the “News” page on this website for an archive of articles and editorials about the Parkway.